The Isabella Stewart Gardner Museum is at once an intimate collection of fine and decorative art and a vibrant, innovative venue for contemporary artists, musicians and scholars. Housed in a stunning 15th-century Venetian-style palace with three stories of galleries surrounding a sun- and flower-filled courtyard, the Museum provides an unusual backdrop for the viewing of art. The Isabella Stewart Gardner Museum's preeminent collection contains more than 2,500 paintings, sculptures, tapestries, furniture, manuscripts, rare books and decorative arts. The galleries house works by some of the most recognized artists in the world, including Titian, Rembrandt, Michelangelo, Raphael, Botticelli, Manet, Degas, Whistler and Sargent. 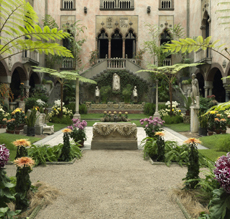 The spirit of the architecture, the personal character of the arrangements and the artistic display of the enchanting courtyard in full bloom all create an atmosphere that distinguishes the Isabella Stewart Gardner Museum as an intimate and culturally-rich treasure. The beautiful indoor courtyard garden that blooms year round is a wonderful treat with stone paths and little benches where you may rest. Family Programs are available for children over five. There is no admission charge for children under 18. Sunday Concerts are appropriate for children 7 and up. Small children should be supervised by their parents at all times. You are welcome to bring single strollers into the galleries; however, we ask that you leave tandem or double strollers at the coat check. The Museum offers strollers to borrow on a first come, first served basis. Museum strollers can be picked up from the coat check. Family guides for suggestions on fun ways to explore the Museum with children are available free of charge at the information area in the Living Room. Sketching materials are provided free of charge near the Courtyard, just outside the Macknight Room. Designed in the style of a 15th century Venetian palace, Fenway Court was built around the turn of the century to house a fine private collection of Italian Renaissance and old masters' artwork. This private collection is now open to the public. Isabella Stewart Gardner first welcomed visitors to her museum on New Year's Day, 1903. On that evening guests listened to the music of Bach, Mozart, and Schumann, gazed in wonder at the courtyard full of flowers, and viewed one of the nation's finest collections of art. Today, visitors experience much the same thing. The Gardner Museum has remained essentially unchanged since its founder's death in 1924. Find lots more ideas on fun things to do with kids in Boston. Paid parking is available at the Museum of Fine Arts garage or lot on Museum Road, two blocks from the Gardner. Metered street parking is also available. Take the Huntington Avenue no. 39 bus or the Green Line E-train to the Museum stop. Cross Huntington Avenue (toward the Texaco Gas Station) to Louis Prang Street. Walk down Louis Prang Street for two blocks. The Museum is on the left. Hanging Nasturtiums - Did you miss last year's display? Don't worry! The 20-foot-long cascades of bright orange blossoms come back again every April. Isabella Gardner was an avid Red Sox fan and season ticket holder. Throughout the year, visitors to the Gardner Museum wearing Red Sox paraphernalia also receive a special $2 off admission. Visitors can also learn more about Isabella Gardner’s Red Sox connections in an archival information binder in the Living Room on the first floor of the new wing.